This article is about national highways. 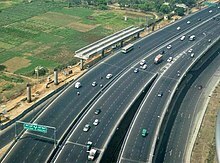 For expressways, see Expressways in India. |The National Highways network of India is a network of trunk roads that is owned by the Ministry of Road Transport and Highways. It is constructed and managed by the National Highway Authority of India (NHAI), the National Highways and Infrastructure Development Corporation (NHIDCL), and the public works departments (PWDs) of state governments. NHAI was established by the National Highways Authority of India Act, 1988. Section 16(1) of the Act states that the function of NHAI is to develop, maintain, and manage the National Highways and any other highways vested in, or entrusted to, it by the Government of India. These highways as of April 2019 measure over 142,126 km (88,313 mi). The Indian government has vowed to double the highway length from 96,000 to 2,00,000 km. As of April 2019, the government had promised to build 15,000 km of roads but has been able to lay down around 10,000 km . The National Highways Authority of India (NHAI) is the nodal agency responsible for building, upgrading, and maintaining most of the National Highways network. It operates under the Ministry of Road Transport and Highways. The National Highways Development Project (NHDP) is a major effort to expand and upgrade the network of highways. NHAI often uses a public-private partnership model for highway development, maintenance, and toll-collection. While National Highways constitute 1.8% of Indian roads, they carry 40% of the traffic. The majority of existing National Highways are two-lane roads (one lane in each direction), though much of this is being expanded to four-lanes and some to six or more lanes. Some sections of the network are toll roads. Bharatmala, a centrally-sponsored and funded road and highways project of the Government of India  with a target of constructing 83,677 km (51,994 mi) of new highways, has been started in 2018. Phase I of the Bharatmala project involves the construction of 34,800 km of highways (including the remaining projects under NHDP) at an estimated cost of ₹5.35 lakh crore (US$74 billion) by 2021-22. India has 131,326 km (81,602 mi) of National Highways (NH) connecting all the major cities and state capitals as of March 2018. National Highways comprise 2.7% of India's total road network, but carry about 40% of road traffic. Most of them have two lanes. About 26,000 km (16,000 mi) have been widened to four lanes with two lanes in each direction as of May 2016. Only a few National Highways are built with concrete. As of March 2016, 20,703 km (12,864 mi) of National Highways were still single-laned roads. India has the distinction of having the world's second highest-altitude motor highway: the Leh–Manali Highway connecting Manali, Himachal Pradesh in Himachal Pradesh to Leh in Ladakh, Kashmir. National Highways form the economic backbone of the country and have often facilitated development along their routes. Many new towns have sprung up along major highways. Highways have large numbers of small restaurants and inns (known as dhabas) along their length. They serve popular local cuisine and serve as truck stops. The Ministry of Road Transport and Highways adopted a new systematic numbering of National Highways in April 2010. The new system indicates the direction of National Highways whether they are east–west (odd numbers) or north–south (even numbers). It also indicates the geographical region where they are with even numbers increasing from east to west starting from NH2 and odd numbers increasing from north to south starting from NH1. In 1998 India launched a massive programme of highway upgrades, called the National Highways Development Project (NHDP), in which the main north–south and east–west corridors and highways connecting the four metropolitan cities (Delhi, Mumbai, Chennai and Kolkata) have been fully paved and widened into four-lane highways. Some of the busier National Highway sectors in India have been converted to four- or six-lane limited-access highways; for example, Delhi–Agra, Delhi–Jaipur, Ahmedabad–Vadodara, Mumbai–Pune, Mumbai–Surat, Bengaluru–Mysuru, Bengaluru–Chennai, Delhi–Meerut, Hyderabad–Vijayawada, Bhubaneswar–Puri, Guntur–Vijayawada, Jammu–Udhampur. The National Highways Act, 1956 provides for private investment in the building and maintenance of the highways. Some existing roads have been reclassified as National Highways. Bypasses have recently been constructed around larger towns and cities to provide uninterrupted passage for highway traffic. The hugely varied climatic, demographic, traffic, and sometimes political situation in India results in National Highways being single lane in places with low traffic to six lanes in places with heavy traffic. Many National Highways are being upgraded or are under construction. Some National Highways are long while some are short spurs off other National Highways to provide connectivity to nearby ports or harbours. A section of NH44 between Bengaluru and the Karnataka–Andhra Pradesh border. It is part of the North–South Corridor. The length of National Highways in the country was 29,023 km in 1980 which expanded to 76,818 km by the end of 2012. ^ "Ministry of Road Transport and Highways". Retrieved 25 October 2017. ^ "National Highways road length to be increased from 96,000 km to 2,00,000 km: Nitin Gadkari". The Financial Express. 17 December 2016. Retrieved 27 June 2017. ^ "Indian road network". National Highways Authority of India. Retrieved 18 April 2015. ^ Mahapatra, Dhananjay (2 July 2013). "NDA regime constructed 50% of national highways laid in last 30 years: Centre". The Times of India. Retrieved 18 April 2015. ^ "New numbers for national highways". The Times of India. 21 October 2011. Retrieved 18 April 2015. ^ "The National Highways Act, 1956". Retrieved 2 December 2012. ^ . Maps of India. 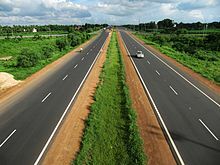 ^ "List of highways in Kerala". ListKerala.com. ^ "National Highway 47A". India9.com. ^ "National Highways Summary - Ministry of Road Transport & Highways, Government of India". morth.nic.in. Retrieved 21 August 2017. ^ "Welcome to NHAI". www.nhai.org. Retrieved 21 August 2017.